We would like to offer our thanks to Randy Dragt (our VP) for his generous donation to our first fish-a-ree. We would also like to thank Superior Gas of Marshfield for their contribution. 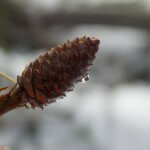 Dexter park: March, 17, 2019 Spring is melting the snow from a bud!!! 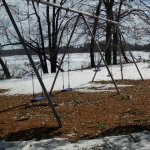 Dexter park: March, 17, 2019 Sun has the grass showing and these things will soon be in full use!! The Yellow River Chapter of KAMO! This weeks column is about never giving up, hard work, and good people! Methodist Church in Marshfield just before 6:00 p.m. with a plan/hope of meeting some people and starting the process of building a KAMO chapter in Marshfield. One of my passions in life is to find a way to introduce as many kids to the outdoors as possible and that is what we do in KAMO. would signify the ups and downs of the eight month project in front of me..
Center, but it was just too far from a population and it fizzled out. When I found out in May that the ship was sinking I made it clear that I was not giving up and that I felt we needed to meet in a town or a city where more people would attend meetings. blessing came in the way of April Onsager. April is a strong Christian mother of three children and a person that under no circumstances was she going to give up on a KAMO Chapter in her area. April was at that first meeting as was Dana Anderson who is a horticulturist for “Weed Warrior LLC” and she had bought her close friend Brad Allen along as I had asked everyone to bring a friend or a family member. New Lisbon was at that meeting and also wanted to make this work. About all you can do at something like this is talk about KAMO and your hopes and dreams. Fast forward to our September meeting, I may be mistaken but there was either only three or four of us but our attitude was positive and we made plans for October. Bob Nicksic ran the October meeting and had a turnout of maybe 7 including his cousin Mike Nicksic who is the Marshfield Middle School Principal and just a great guy. I was on a hunting trip and talked to Bob directly after the meeting. Bob was positive but he was also clear that he wanted this group to start growing some wings. We met at the Northwood Historical Society all fall and at the December meeting there was maybe 7 of us and my main thought was these guys needed to get outside with some kids and do something. Mike’s and for a bonus I had Ruby, Fire, and Ruby’s three week old litter of pups. Bill Dickerson who is a solid member of the Meadow Valley Chapter had bought his five air rifles and taught the kids a lot. There was a campfire, food, some education, and a hike. April Onsager made a video of the event before the day was over and we made our next plan which was a kids fisheree. These guys and gals were now a proud group and gave themselves the name of The Yellow River Chapter of KAMO “formally MarshPoint” check them out on facebook. This past Saturday we had a fisheree on Lake Dexter just for kids and at first our world fell a part or should I say sunk as the ice on our lake had sunk due to heavy snow and was all slush. of snow about 6-feet wide for about 150 yards. The kids could walk on the snow and we drilled holes to fish out of on the side. loves taking pictures. With great pride I realized that this chapter now has a core group of 11 and by that I mean in it to win it people and several folks that will help on occasion. everything is free for kids and I urge you in what ever way you can, to be a part of KAMO. P.S. KAMO members also do one on one mentoring or small groups! This was a Yellow River Chapter event, March 2, 2019. It was a tough day fishing but sure was a good day playing.